In the far reaches of space, the aliens of the cosmos vie for control of the universe. Alliances are constantly forged and broken in the pursuit of power as starships journey from planet to planet, ready to build colonies and battle foreign powers, ensuring the survival of their people as they spread throughout the stars. Fantasy Flight Games is proud to announce the upcoming release of Cosmic Encounter 42nd Anniversary Edition! Now is the perfect time to return to Cosmic Encounter or to experience the classic game of intergalactic colonization for the first time. Cosmic Encounter 42nd Anniversary Edition will become the new standardized version of the game when it hits shelves in the third quarter of 2018, and it remains compatible with all existing Cosmic Encounter expansions. To see the exciting changes that await, read on at Fantasy Flight's official 42nd anniversary page! Get Future Pastime's version of the inside story here. This classic game of alien politics returns from the warp once more. It features 51 alien races, flarecards to boost their powers, 100 plastic ships, a host of premium components, and tech cards that let players research and build extraordinary technological marvels! 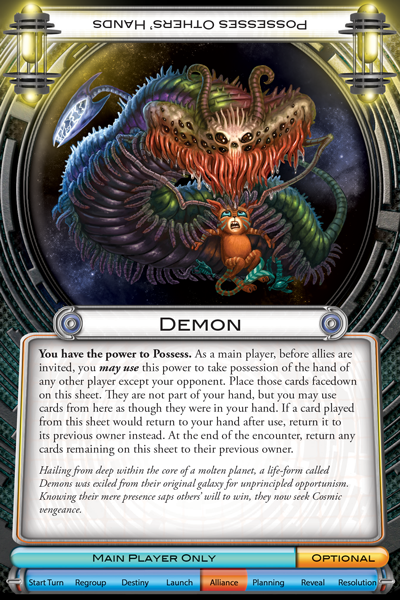 Cosmic Encounter was reimagined by Fantasy Flight’s designer Kevin Wilson in 2008. His standardization and display of the game phases became an important improvement for the logical glue that held everything together and allowed the game to expand to 165 aliens. Thank you Kevin! Interesting fact, among the 50 aliens FFG chose for the basic game of Cosmic Encounter were two aliens, Mite and Tripler, invented for the now defunct Cosmic Encounter Online flash game. When we first designed Cosmic Encounter in the early seventies, we played the pre-published prototypes with only six aliens for several years. Plant, Machine. Virus, Diplomat, Mind, Crystal. We didn’t know there were any other aliens. When we formed Eon Products and published the first edition in 1977, the game had 15 aliens. By the time we got out of the production business Cosmic had 9 Expansion Sets and 75 aliens. Cosmic Encounter had so many features in a game that had never been done before that it didn’t fit into anyone’s idea of a game. It wasn't really a board game (no board). It wasn't just a card game, it had all kinds of pieces and parts. Not a dice game. No dice. It wasn’t a role playing game because there were no roll playing guides and charts. Nevertheless, the alien identities changed how players played and how they felt about themselves and other players. Players enjoyed “being” specific kinds of aliens. The tongue in cheek alien identities enhanced the social gaming experience. Playing Cosmic Encounter was and is fun and funny. Cosmic Encounter changed the world of board gaming forever. Want to know the whole Cosmic Encounter story? We believe this to be the most definitive article ever written about Cosmic Encounter, including archival photos and insider designer commentary.